certain parts. Slime, a gelatinous organic growth and algae, a green moss is common formation in the cooling tower interior. Their presence interfere in the tower efficiency. Water treatment companies provide proprietary compounds to control the growth of slime and algae. Chlorine and chlorine containing compounds are also effective algaecides and slimicides, but excess chlorine can damage wood and organic materials of construction. In case, chlorine has to be used it should be added intermittently as a shock treatment and only as frequently as necessary to control slime and algae. Residual levels of fee chlorine must be removed from the water. Chlorine or chlorine containing compounds has be added carefully since high levels of chlorine will occur at or near the point of entry into the circulating water system. This kind of situation cause a localized reduction of pH and resultant corrosion. One best way to get rid of scale formation and corrosion problem is to install scale ban in the system. 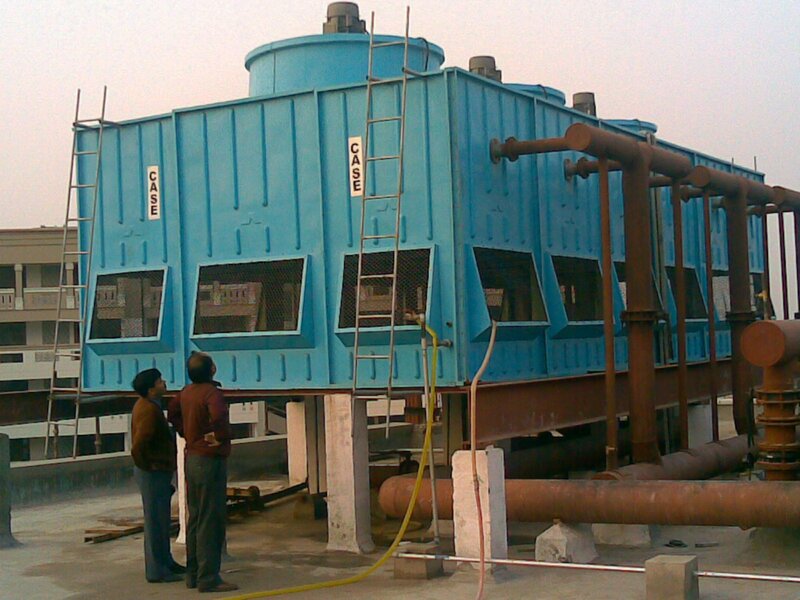 It is a non-chemical equipment which requires no maintenance and ensures zero pollution. For details, feel free to contact engineers @ CASE Group.